Majority of men who will go to Hell will suffer that terrible fate because of women. The downfall of many men - Pastors, Kings, Leaders - is women. It gets worse if you are a Pastor and don't learn how to control your flesh and Lust for worldly pleasures. It's unfortunate. A Nigerian wife has cried out after she discovered that her husband just got married to a woman he claimed was his sister and that they already have two sons. According to reports online, Christabel Idahosa has been married to Pastor Glory Idahosa for years and their union is blessed with 5 kids - 4 girls and 1 boy. For the most part of their marriage, Pastor Glory was allegedly jobless and his wife Christabel took care of the home and finance, up until 3 years ago when he opened a church in Canada with the help of his wife. He also returned to Nigeria in 2016 to open a branch of the church with money given to him by his wife and the church in Canada. 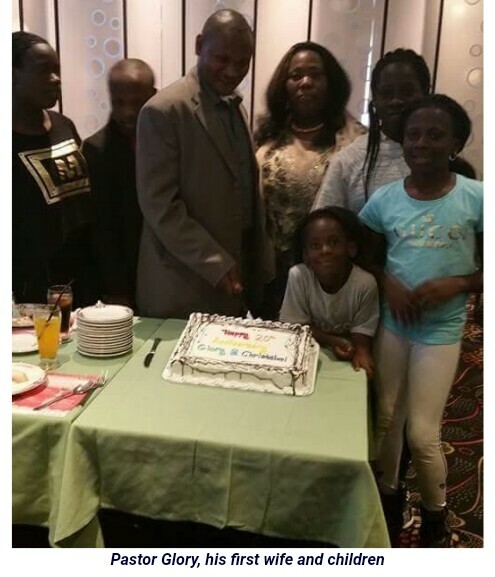 Prior to opening the church in Canada and Nigeria, Pastor Glory visited Nigeria with his wife and kids 5 years ago and he introduced his wife to a woman named Splendour Patrick. He introduced Splendour as his younger sister and his wife, Christabel believed him. In 2016, Pastor Glory told his wife he needed money to open a branch of their church in Nigeria. He was handed 2.8 million Naira and he set out for Nigeria where he stayed for months with the excuse that he was busy working to help the church pick up. He returned to his family in Canada months later. In June 2018, Christabel returned home to find her husband packing his bag. He informed her that his mother died and he needed to return to Nigeria urgently. He also claimed he needed to attend some family meetings and look into the progress of the church in Nigeria. His wife remained in Canada with their children, not suspecting anything, until last night when she saw her husband's Facebook page being updated with wedding photos. It was her husband getting married to Splendour Patrick who he claimed was his younger sister. It also turns out that they already have two sons who look to be about 5 and 3 years old. The pastor has been criticized on Facebook after his first wife's family exposed his infidelity and he proceeded to block his in-laws on Facebook. Church members in Canada are upset after finding out their pastor is guilty of bigamy. They have also called him out on Facebook and are asking him to come and close the church in Canada. They claim they had been trying to call him when he was gone for long but he never picked, only to discover on social media that he took another wife. Those who live anyhow, remember there will be an END. Simple!